Circa 1930s: Decatur, Illinois, carver H, G. Traver's decoys are difficult to find, and this bluebill is a fine example of his work. Circa 1939-1941: Born in 1902, Pekin, Illinois' Edgar Vale was a machinist by trade, and this skill, along with his knowledge of local waterfowl, undoubtedly helped him perfect his decoy carving skills. In the seminal volume on Illinois River decoys, Decoys and Decoy Carvers of Illinois, authors Parmalee and Loomis explain that Vale "did most of his hunting...near Bartonville and Quiver Creek and Spring Lake" and "shot over early factory decoys and old handmade birds produced by others during the 1920's and early 1930's" until economic conditionsforced him to begin "making his own birds about 1935...until the beginning if World War II." Vale's early birds, 100-125 of them, as Parmalee and Loomis state, "were fashioned with cork bodies that were fitted with pine heads set in place with dowel rods" while Vale carved the final 50-60 birds, "produced from 1939-1941, completely of wood, using two hollowed out sections of hemlock for the body." This fine 13" turned head mallard hen has a completely untouched original surface and is one of very few produced by this talented and folksy relatively little known carver. This is a rare opportunity to own a very scarce folk art Illinois River decoy made in the heart of our home state's carving territory. 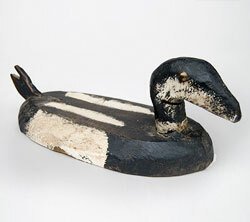 Circa 1910-1930: This striking pintail decoy found in Lafayette, Indiana, has fantastic paint, a gracefully carved head, and a very unusual tail construction. 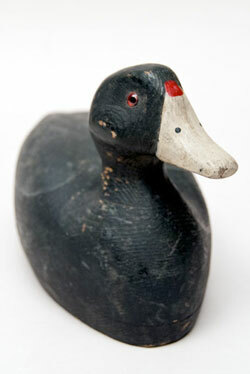 Circa 1920-1940: It's hard to find Illinois River decoys that are this primitive. 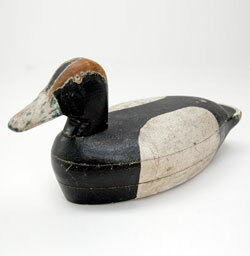 This beautifully naive tackeye epitomizes the working decoy -- made to get the job done and not to impress the neighbors. 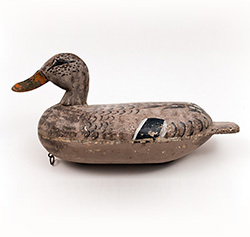 This hand carved antique duck decoy is a real charmer and is sure to add color to any collection of American folk art, decoys, or primitives. 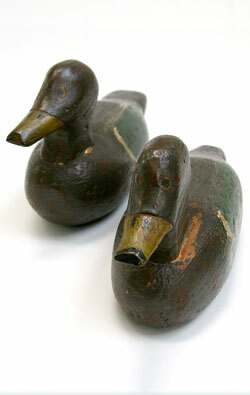 Circa 1920-1940: This handsome pair of second quarter 20th century Illinois River bluebill working decoys measure 12" long, 6 1/2" high, and 5" wide and feature wonderfully carved wings and unusual painted wood eyes set with tiny finishing nails. These old working decoys are in good condition with a few minor losses and cracks, but they are structurally sound and absolutely gorgeous in their old, if not orginial, paint. The carver of this fine pair of bluebills is unknown to us, but it is obvious that he took great care in both carving and decorating his birds. Note, too, that there a is an old museum or collection number on the bottom of each bird. The previous owner was obviously very proud of these ducks. 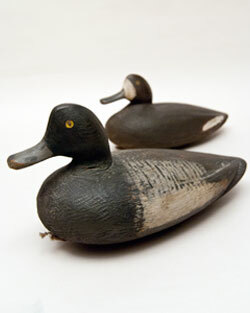 This is an excellent pair of antique Illinois River decoys at a very affordable price. 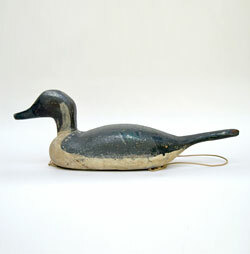 Circa 1920-1940: Original Paint, Fantastic Form: Striking 5 1/2" long tail and its primitive original painted surface, combine to make this pintail decoy a truly excellent example of antique American folk art. 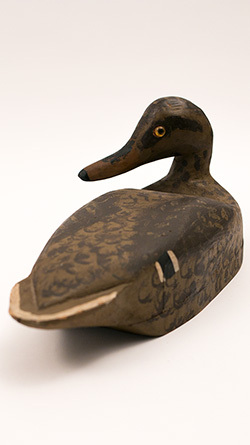 Circa 1940-1960 Illinois River Decoy: The wonderful turned head, graceful carving, two piece construction, and original surface on this mid 20th century make this handsome and petite10 1/2" long, 5" tall, 4" wide Illinois River coot decoy a superb piece of Midwestern folk art. Althought thedecoy's carver is unknown to us, it is obviousfrom the fine construction, carving details, and realistic paint pattern of the coot that the maker had to be highly experienced and highly skilled. 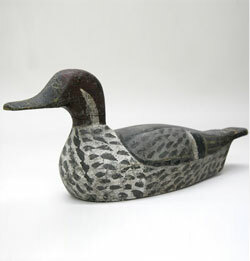 This is a great decoy at a very fair price and is guaranteed to please its new owner.